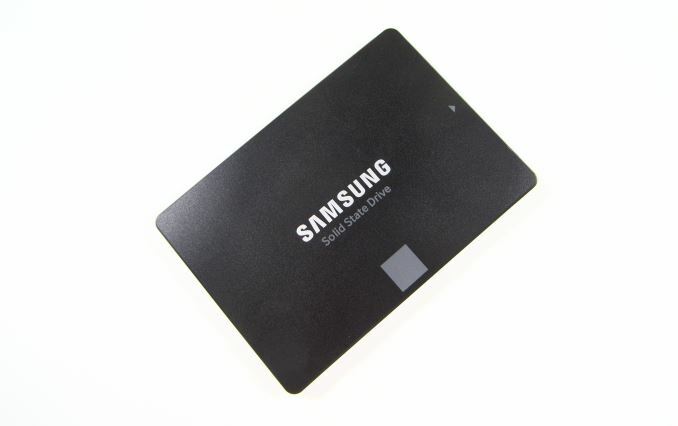 In 2014 Samsung brought 3D NAND (branded as V-NAND) to the consumer SSD market with the 850 Pro and 850 EVO SATA SSDs. Based on the MLC and TLC versions respectively of Samsung's 32-layer second-generation V-NAND process, both models raised the bar for SSD performance and remain essentially unchallenged except by PCIe SSDs. The 850 EVO in particular defies the usual image of TLC SSDs as being relatively slow, power-hungry, and susceptible to problems with long-term data retention or write endurance. Most TLC drives are low-end or at best mid-range in the SATA market, but the 850 EVO for the most part competes against MLC drives in the mid to high end of the market. Last year, the 850 Pro and EVO lines were expanded with 2TB models based on an upgraded controller with support for the larger quantities of DRAM required to keep track of so much NAND flash memory. The 2TB 850 Pro introduced a 128Gb die version of Samsung's 32-layer MLC V-NAND to replace the 86Gb die used by the smaller 850 Pros. However the 2TB 850 EVO continued to use the same 128Gb TLC V-NAND as in the smaller capacities. Later in 2015, Samsung announced their third-generation 48-layer V-NAND process to provide 256Gb MLC and TLC parts. The plan was to switch existing products like the 850 and 950 series SSDs over to the new V-NAND beginning in early 2016 and to introduce the higher capacities it enables. The transition to the newer V-NAND has not been as quick as originally planned, but we have seen it show up in the Portable SSD T3 and the 1TB 850 EVO M.2 that has recently become available. The 48-layer V-NAND is now coming to the 2.5" 850 EVO line in the form of a new 4TB model. It turns out that the MHX controller introduced for the 2TB models supports 4GB of DRAM, so the new 4TB 850 EVO only required changing the NAND, bumping up to a higher-capacity DRAM chip, and a firmware revision. The rest of the drive—controller, PCB, and case—are identical to the 2TB model. It is a general rule that larger SSDs tend to be faster, but as we saw when the 2TB 850s showed up, the SATA interface doesn't leave much room for improvement and the overhead of managing more flash can sometimes slightly hurt performance. It's no surprise then that the performance specifications of the 4TB model are identical to that of the 500GB, 1TB and 2TB models. The idle power consumption rating of the 4TB 850 EVO is slightly higher than the 2TB model (likely due to the increased DRAM), but the new V-NAND gives the 4TB 850 EVO substantially lower active power consumption ratings than any previous capacity. The one disappointment in the specifications for the 4TB 850 EVO is the write endurance rating, still the same 300TB total as the 2TB model. A warranty that expires after only 75 drive writes is concerning even if the total bytes written quantity has been reasonable in the past. It can come across as an indication that Samsung lacks confidence in their new V-NAND, which is at odds with the 5-year warranty the drive carries. For comparison, Samsung's enterprise PM863 based on the older 32-layer TLC V-NAND has a three year warranty but a 5600TB endurance rating for its 3.84TB model. Fortunately, it appears that the write endurance rating of the 4TB 850 EVO is very conservative: the testing subjected it to a total of around 7 drive writes but the SMART lifetime indicator is down to only 99% rather than the 90 or 91% implied by the 300TBW rating. Meanwhile thanks to TechInsights, we know a bit about what makes it possible for Samsung's third generation V-NAND to offer higher capacities that are both more power efficient and more cost-effective. In addition to raising the layer count from 32 to 48, Samsung has tweaked several aspects of the design. The NAND cells still use a charge-trap design (in contrast to the floating gate used by planar NAND flash), but with some dimensions reduced, an extra metal interconnect layer, and more compact logic and I/O regions on the die. The net effect is that density has increased from about 1.86 Gb/mm^2 for the 32-layer TLC to about 2.6 Gb/mm^2 for the 48-layer TLC in this 4TB 850 EVO. Another trick up Samsung's sleeve is the use of F-Chips, an idea they presented at ISSCC 2015. The F-Chips serve a similar purpose to the buffers on FB-DIMMs for DRAM: rather than directly connect the SSD controller to a stack of NAND dies using a multidrop bus, the F-Chip is an interface chip that is connected to the SSD controller, and it in turn connects to two groups of four NAND dies. 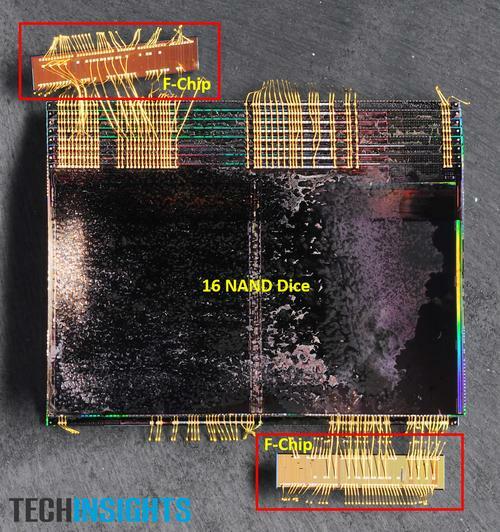 Because the tiny F-Chip inhabits the same BGA package as the stack of NAND and because its connections to the NAND are shared across only four chips instead of 8 or 16, maintaining signal integrity is much less of a problem. Likewise, the sharing of the bus between the NAND package and the SSD controller is reduced or eliminated. 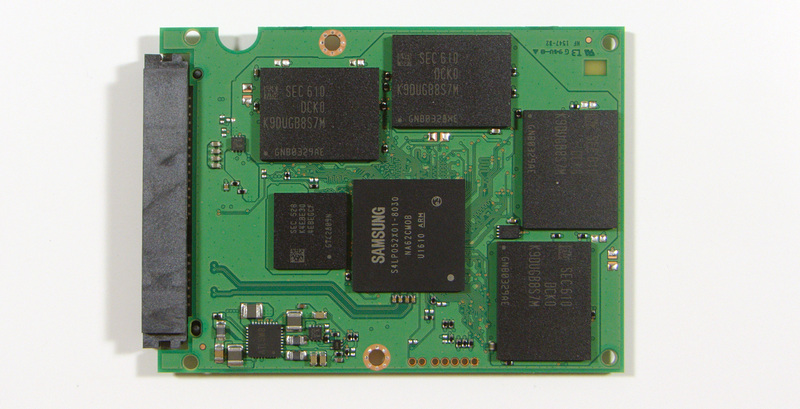 The original intent of this development was to allow for much higher throughput between the SSD controller and the NAND so that PCIe SSDs wouldn't need an extreme number of channels, but the reduced signal integrity concerns may have also allowed for some simplification of the I/O circuitry on the NAND chips. The F-Chip still presents a toggle-mode DDR interface to the SSD controller, so it is essentially transparent and doesn't require any controller modifications. Given how SSD capacity is related to both performance and power consumption, we generally prefer to compare drives of similar capacities. The 4TB 850 EVO doesn't leave us any good options: most consumer SSD product lines still top out around 1TB, large enterprise SAS and PCIe SSDs wouldn't be a useful point of comparison and a RAID array of several smaller SATA SSDs wouldn't quite be fair either, and I don't even have a mechanical hard drive larger than 3TB handy. For now, the 4TB 850 EVO is in a class of its own. It should be joined soon by a 4TB 850 Pro, but other than that most of the competition will only be reaching 2TB capacities this year. For this review, the 4TB 850 EVO will be compared against the other capacities of Samsung 850 EVO and 850 Pro as well as the largest of several other SSD product lines that compete more directly against the smaller capacity 850 EVOs. With a MSRP of $1499 (37.4¢/GB) the 4TB 850 EVO should not be significantly more expensive per-GB than the 2TB model, which carries only a modest premium over the most cost-effective 500GB and 1TB capacities. The total price may be shockingly high, but per gigabyte it is not unreasonable. Doesn't really mater if the price goes down, its still a niche product. The EVO's are great general purpose desktop drives. But the people who need a general purpose desktop drive, mostly don't need 4TB and would not buy one at $500 let alone at $1500. In my case, I've got a 250GB Evo and a 1 TB spinning disk for storage of music, pictures, video etc. So I guess a cheap enough 2 TB SSD could work for me just because it would be marginally easier to not have two separate chunks of storage to deal with...but thats just a marginal increase in convienience. The stuff I have on a spinning disk doesn't really need the performance of an SSD anyway.